Second round action at the Prudential Hong Kong Tennis Open kicks off on Wednesday with the number two seed, Venus Williams going up against the world number 48, Alizé Cornet for the seventh time on the WTA tour. Venus overcome a sluggish start to defeat Risa Ozaki in the first round, winning eight of the last nine games for a 6-4 6-1 win. Ozaki, who chased down many balls, was twice up a break but was unable to consolidate as an aggressive Venus looked to take control of the points and charge forward. Venus hit a handful of blistering forehands as Ozaki struggled to contend with the depth and pace. Serving with scoreboard pressure at *4-5, Ozaki couldn’t hold onto her serve as a drive volley found the net down set point. Venus showed her experience in the second set, twice holding from break point down. Ozaki hit a few more winners in the second set but struggled to generate pace, particularly on return. Venus’s serve has looked laboured since the US Open but her groundstrokes have been impressive. The backhand was working beautifully in the second set including on match point as she hit a winner down-the-line to secure the victory in 73 minutes. Venus seemed in high spirits at the end of the match and even suggested in her post-match interview that she was going to try and get Serena to come to Hong Kong next year! In an unstreamed match, Cornet had a solid opening round win against Varvara Lepchenko, 6-3 6-2. 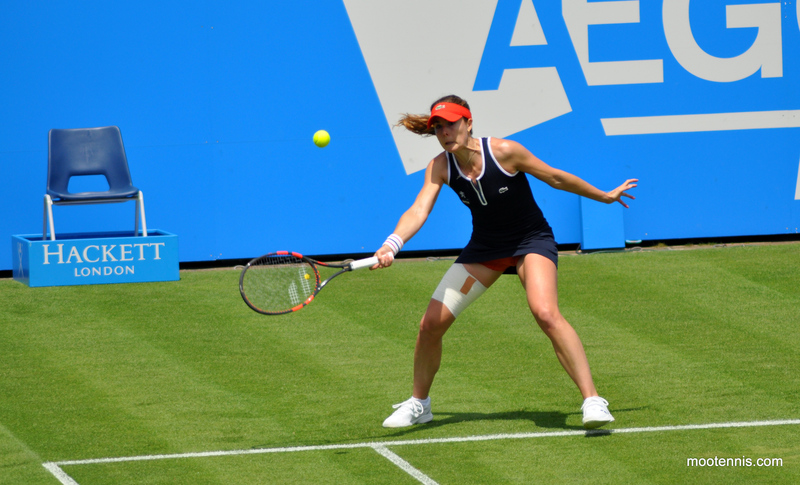 I expected a really tight encounter but Cornet took control from *1-3 down in the first set. The win over Lepchenko was Cornet’s 23rd match win of the year, matching her total from 2015. Cornet has cemented her place in the world’s top 50 this year, dropping six places from her ranking at the start of 2016. The Frenchwoman has been missing consistency week-to-week and since winning the title in Hobart in the second week of the year, has only won multiple matches at the same tournament on five occasions. Head-to-head record: Venus has won all six previous matches although Cornet did win her first ever set against the American at the French Open earlier this year. Venus eventually prevailed, 7-6(5) 1-6 6-0. Through their first six matches, Cornet had never won more than four games in any of the 12 sets they had played. The pair met in the quarter-finals of Hong Kong last year where Venus won, 6-1 6-1. Interesting stat: Cornet has won five of her last six three set matches on tour, while Venus has won just one out of her last four. Final thoughts: This has always been a dominant match-up for Venus which is perhaps a surprise when compared to sister, Serena who has always had tough matches against Cornet. Venus’s willingness to be aggressive and in particular, close points at the net has always held her well in this match-up. Venus looked to be aggressive in the first round against Ozaki, with varying degrees of accuracy. No doubt Venus will look to do the same against Cornet, who has a similar game to Ozaki but with greater experience on the tour and more intent to go for her shots. October 11, 2016 in Cornet, Hong Kong, Venus, WTA.